He watched her intensely as she moved around the ballroom, flitting from person to person, who congratulated her on a superb performance. He hadn't been able to take his eyes off her since she walked out on the stage. How could he? Her body moved like a dream, and looked as smooth as silk. Every step was ethereal, even once she left the stage, it seemed like she floated across the ballroom floor. Her smile made his heart beat fast, her laugh made his stomach flip, but her soft eyes struck fear into his soul, as kind as they were. He didn't know green was his favorite color until she briefly locked eyes with him a short while ago. "See something you like Robbie...?" The knight jumped and turned to his friend. Lord Campbell, amused at his captivation, grinned at him from his gilded seat. He could feel the heat of his face reddening. "Not particularly, Sire." He shifted on his feet, shame making him restless, hoping his friend would give up. Unfortunately, the feeling only got worse as his friend laughed at his embarrassment. The young Lord cleared his throat before speaking low, "You know, this is my party... and you're my friend, Robert. I can pull some strings... if you want." He shrugged and sunk back into his chair, gleefully watching him from the corner of his eye. Now he watched the other party-goers and guarded the Lord, as he was supposed to. But... she passed his gaze once more, and he couldn't help but let his eyes follow her for just long enough to get a barking laugh from his friend. He turned and glared at his mirth, causing more giggles to befall the Lord. "It's not funny." "Are you joking?" He shot up from his slumped state, once more to smirk at Robert, "You should see yourself - gawking at her-"
"I'm not 'gawking'." He growled. Lord Campbell hummed, unconvinced. "Sure, then you wouldn't mind if I called her over here...? 'Oh yes, this red fellow is my personal Guardsman, and he quite likes your form- that is, the physical one'-" His groan of frustration only reignited the unending laughter. "Oh come on, lighten up, Robbie. I'm only teasing you, are you afraid I would actually embarrass you?" At this point, he wasn't sure he could say 'no'. He sighed and tried to go back to doing his job; watching the entrances, eyeing anything suspicious, enduring the Nobles' ignorance of personal space, watching the light shine off of long, curling locks- He looked at the ceiling, the floor, anywhere she couldn't distract him. "Come on." Lord Campbell stood and hopped - literally - onto the marble floors. "Where are you going, My Lord?" He passively inquired, following him and his suspicious smile. People parted and moved aside for the host of the party, and owner of the keep. "We are going to send our congratulations to our esteemed guest." He nearly stopped in his tracks as his stomach dropped, but he rushed his steps to keep up. "There she is!" It was too late; There she stood, turning to smile at them. She curtsied in one fluid, graceful motion. She was even more beautiful up close. He could feel his throat tighten as he tried to swallow the lump that sat in it. "Good evening, Lord Campbell." He held in a sigh as she spoke, the sound soft and hauntingly pure. The dry feeling in his mouth intensified as he watched her lips move, trying desperately to keep the thought of capturing them out of his head. "This is a wonderful party. I am enjoying myself very much." "Surely, not as much as we enjoyed your stunning performance. Ah, this is my personal guard, and dear friend, Sir Robert Johnson. He has been dying to meet you. Robert, this is Lady Serena Thorne." He thumped Robert on the back, breaking his trance. He looked back at the Lord's smile, only to turn and lock eyes with her once again. He couldn't move, he could hardly breathe as he sunk into her eyes. His brain and mouth sputtered to come up with a reply but before he could, another noble came up. "Pardon me, my Lord, if I may intrude; I have a request for Lady-"
"Adam! Fantastic, I was hoping to see you tonight!" He let go of Robert and grabbed 'Adam' by the shoulders, "Robert, would you be so kind as to accompany Lady Thorne until I return?" The Lord protested softly, but Lord Campbell shushed him, "I must speak to you about some business..." He glanced back and nodded fervently, eyes motioning to Serena. In that moment, he had the single greatest friend in the kingdom. But there they stood, silent as Lord Campbell left with the distressed noble. She watched him with a smile, and he stood stiffly beside her, trying not to stare. He couldn't think of a single thing to say, nothing that wasn't inappropriate or strange, or Saint forbid, boring. "Sir Johnson?" He flinched at the dulcet sound breaking their silence. He stammered, "J-just... Robert, if you'd like. Neither My Lord, nor I, are very fond of formalities." Her smile widened just a bit, and it made his heart thud harder. "Only if you promise to call me Selena." He looked up from his feet to look deep into her eyes. Surely he was reading her wrong. She couldn't be interested in him. "If that is what you wish." Now she broke into a full grin. He both dreaded and so desperately desired to hear what she thought. "Oh...?" She took a single, delicate step forward, and he looked down just in time to see that under her formal gown, she still wore her dancing shoes. "And what if what I wanted was scandalous?" He contemplated the thought of laying down in the middle of the floor to recover from her words, and his shaking knees tempted him. Her laugh, unlike Lord Campbell's, was soft and pleasant to listen to, even at the expense of his own pride. "I-I'm sorry, I couldn't help myself." She gave him his space back and gave him an apologetic smile, "I just hate those moments before you can relax with someone new." 'Oh.' It took him a moment, but he managed to give her a nervous laugh. "It's fine, Serena." She was joking with him. Of course. But it was true; he could relax a little easier now that she had broken the ice. "Tell me, is this your first time in Ashton?" She nodded, "In Patrium, Actually. I grew up in Port Westry, I traveled once I started dancing. It's beautiful here." They wandered as he listened captively. "Lord Campbell rushed and fought to hold my attention earlier to invite me here, but I can never say no to a party. However, I adored the carriage ride here; the trees are turning such a beautiful shade." They chatted for some time, and he hoped the Lord never returned. Even when they were interrupted by nobles wanting to talk to her, she always returned with the excuse that he had been assigned to her. They talked about the world and the landscape, about travel, and politics. They talked so much so that he had started to notice the thinning of the crowd, and caught glimpses of Lord Campbell trying to hide from their sight. "He is a funny man, isn't he?" He blinked. She was so brash, it was strange hearing some of the things she said with her voice attached to it. "I, um..." He looked down. He wanted to tell her that he was stalling but dismissed the thought. "Yes, occasionally." She hummed thoughtfully, "Then I do have a dilemma... 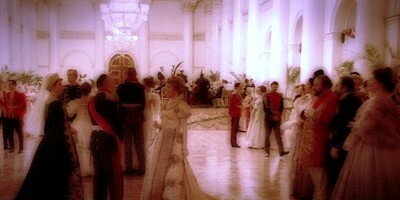 I had hoped for the chance to dance with Lord Campbell, but seeing how he... hasn't returned... I must do without." The almost sad look she gave was innocent, but her eyes sent a different message to him, hinting something at him. He paused, and then it hit him. He bowed and offered a hand to her, "Would... Y-you like to dance with me...?" He had two left feet, and yet he asked - He would be crazy not to. She took his hand with a pleased smirk, "I would be honored." Her skin was as soft as he had imagined, and he couldn't help but run a thumb over her knuckles. She lead them out into the middle of the floor, nobles whispering and staring at them in envy. He didn't know the steps when the music began, his mind going blank once more, but it didn't matter. She danced around him while he moved like a fool. One good thing was that he couldn't step on her toes in her pointe shoes. The world fell away, letting them dance forever. He feared he would fall with it if she let go of him, so he held her tight against him. Song after song, they danced together until the band refused to play. Eventually, he was forced to let go of her, and to say goodnight. As she disappeared into the night, he felt his heart leave with her. The next morning, he left Ashton to follow her, determined to keep his heart nearby.